Those sounds might not read well on the printed page, but if you grew up in the 70s and 80s and were a baseball fan, I'm willing to bet that you could name that tune in two notes. The instrumental known as "Jet Set" was just the theme to a game show named "Jackpot" that lasted less than two years on NBC before April of 1977. 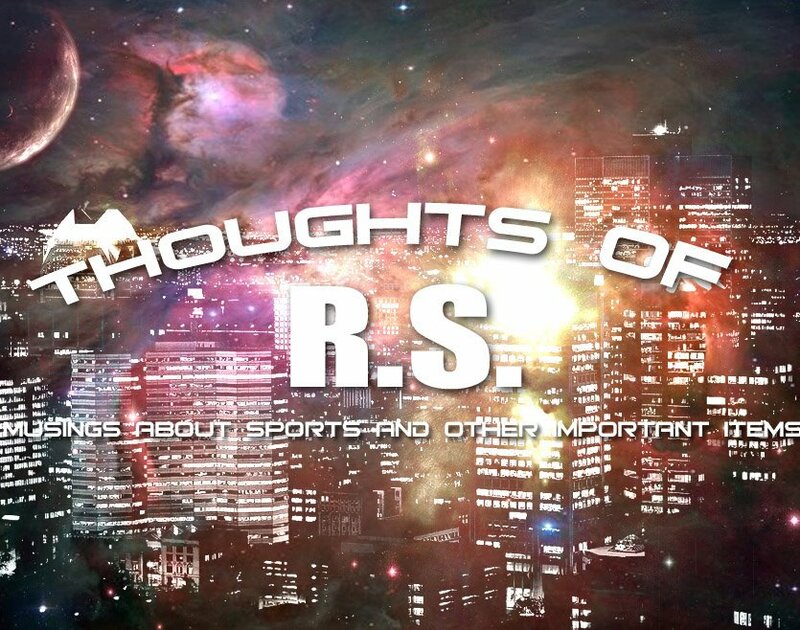 And then that theme became a part of the sports fans culture with the start of "This Week in Baseball". Major League Baseball's film department never approached what Steve Sabol built with NFL Films in the 1970s and I'll always believe that Sabol's work with the NFL was a key reason in football passing baseball as America's most popular sport, but they did make one solid contribution with "This Week in Baseball". The syndicated show could be bought by any station but was usually purchased by NBC affiliates and placed in front on NBC's baseball "Game of the Week", which at that time was the only national telecast of MLB as ABC's Monday Night Baseball generally televised one of a few regional games. One couldn't have a better "pre-game" show than highlights that you haven't seen unless it involved your local team that then would happen to have televised that game. Unless you lived in those days, you cannot understand just how little baseball that fans actually watched live. You had some road games of your local team, maybe the home opener, the NBC game on Saturday afternoon (and the Monday game in later years) and that was the ball game, so to speak for the available games to see. The smartest decision that the show made was installing veteran Mel Allen as the voice of the show. The folksy Allen was known as the "Voice of the Yankees" and between the location of the largest city in the country and in the days when the two participating teams announcers were used for the postseason, the Yankees dynasty meant Allen was extremely well-known by the national audience. After Allen's surprising firing by the team following the 1964 season (the Yankees would not return to the postseason until 1976 when they had hired Allen back as pregame host), Allen hadn't been seen on the national stage with baseball since. Scooping the veteran up for the premiere of the show gave the show a veteran presence to older fans, yet his lack of recent exposure allowed Allen to be more of a fresh voice to younger fans than he might have been otherwise. A comparable example would be Ray Scott, who was the longtime voice for the NFL through the 50s and 60s, but by the mid-70s was considered past his prime and would never have the same exposure even on NFL Films, where he once did their "NFL GOW" in syndication. Had Allen continued on Yankee broadcasts, he might have never gotten the TWIB position because he might not have been "cool enough" to the younger fans on a Saturday afternoon watching in between cartoons and the game of the week. From the highlights from teams playing well from around the league to the spectacular plays, all the teams were well represented, which isn't always the case today, let alone in the time of TWIB. Allen's catchphrases "How 'bout that?" 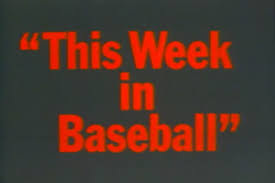 "Hello, there everybody, this is Mel Allen" and of course "This week in BASEball!" became everyday lingo among baseball fans and kids playing pickup games and Allen's narration added so much to the show. Allen may very well have been irreplaceable in the position. Much like NFL Films, TWIB did an excellent job of pairing music to their highlights with big brassy sounds booming out of the speaker along with Rod Carew slapping a ball into the gap, Mike Schmidt driving a ball into the seats, or George Brett diving into the seats in an attempt to catch a popup. Half of putting together a highlight video is matching the perfect music to what highlight is being shown and while the NFL version often has to match good and bad results, TWIB usually, with the exception of the blooper segments, were advertising the best in the game and matching spirited, upbeat backgrounds to what is happening on the screen. Music in these situations set the tone and the right music just makes the viewer feel the anticipation and emotion of the moment. MLB didn't master the total emotional peaks and valleys with TWIB as the NFL counterpart did, but they were doing a different type of program and what they did the music matched perfectly. TWIB ran from 1977-1998, but its heyday was from 1977-1989 when NBC held the rights to MLB. CBS would pay a record amount to move baseball to their network for the 1990 season and then made a ridiculous decision to limit their telecasts to the postseason with the elimination of the game of the week. Without TWIB being able to slot in as the natural lead-in to the game of the week, the ratings for the show dropped and with exposure dwindling the demise of the show was a matter of time and the 1996 death of Allen (his participation had begun to decrease anyway due to declining health) saw that the end was coming and in 1998 it did so. Fox revived it in 2000 for an eleven-year run, but times and viewing habits had changed and it never seemed to find its audience as much of its content was old news in an era of cable television and internet. Still, I have such a fondness for that show which was such a part of my baseball fandom as a fan that didn't root for the local team and between pro wrestling from 11-12, TWIB 12;30-1, the game of the week after and then the various network boxing shows, Saturday's were loaded with things to watch for me and I'm not sure I'll ever have that level of excitement for that type of lineup again. Whether it was nostalgia for times gone by or it really was fun to enjoy the weekend, TWIB was a big part of those days and it'll always be special to hear that opening blast of brass! The boxing weekend was brought to you from Brooklyn, New York, and Houston, Texas and to my surprise, was far better entertainment than I expected Saturday night. Starting with the PBC on national television on Fox with the return of WBA welterweight champion Keith Thurman after 22 months away from the ring. The good news for Thurman was that he generally dominated the fight, boxed well and showed power in flooring Lopez in the second round. The bad news was Lopez, who does not have a reputation as a huge puncher, badly hurt Thurman in the seventh round, sending a dazed champion wobbling around the ring so badly that the three official judges all gave Lopez a 10-8, a rarity in a round without a knockdown. Thurman's majority decision should have been unanimous (I had Thurman a 116-110 winner) and I think the judge that scored it a draw was way off base, but although his performance was good, it wasn't great and much as in Thurman's win over Luis Collazo that saw Thurman badly hurt from a Collazo (another fighter not noted as a banger), you walk away thinking more about what if that had been Errol Spence or Terence Crawford hurting Thurman than about his victory. Adam Kownacki blitzed former world title challenger Gerald Washington in two rounds in the co-feature. A Kownacki right had Washington in major problems near the end of the first round and two knockdowns followed in round two to end the fight. Washington has lost three of his last four, all by stoppage, and looks to be sliding to journeyman status, while Kownacki will continue to have exciting fights and I'd even wager that should he keep winning might be the post-Tyson Fury opponent for Deontay Wilder. Both are promoted by PBC and Wilder will be due for an optional defense, I'd bet that happens. In the first fight, Tug Nyambayar won a unanimous decision over Claudio Marrero to become the mandatory challenger for WBC featherweight champion Gary Russell. which means we might be lucky to see Russell-Nyambayar in 2021. Nyambayar walked the game but outgunned Marrero down and almost ended the fight in the third. Marrero was penalized for a late hit in the tenth, but that didn't change the fight on my card, which had Nyambayar a 116-111 winner. 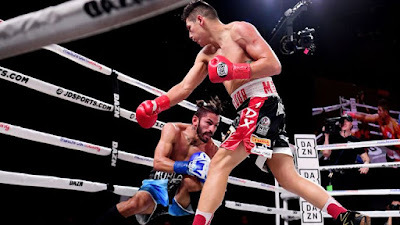 Meanwhile, Houston was the host for Golden Boy and DAZN for a card that didn't seem to have much at all other than another viewing of the exciting young WBO junior middleweight champion Jaime Munguia in what looked to be a squash match. Munguia won the fight going away (118-110 on my card), but the winner of the night was the heretofore unknown Takeshi Inoue, who took about every bomb known to man and showed a LaMottian chin in going the distance and firing enough overhand rights to make him dangerous. It truly shows the old adage that sometimes, no matter the puncher, some guys simply aren't going to go on a particular night. This fight was far more entertaining that I had any right to expect and I'm very interested in seeing both Munguia and Inoue again- I would have placed very long odds on that. Both fighters threw plenty of punches, with Can having the edge in punches thrown and Rojas throwing the bigger punches. Can won the decision far wider on the cards than I would think in winning by 4, 6, and 8 points as I scored the fight a draw at 114. I would not be opposed to a rematch. Undefeated welterweight Vergil Ortiz stopped his 12th foe in a row when the corner of late replacement Oscar Valdez stopped the fight after a fifth round that saw Valdez stung and cut. Valdez was the first fighter to last more than three rounds with Ortiz, who looks to be ready to take another jump in competition. In the boxing challenge- I outscored Ramon Malpica seven to six in the boxing challenge. We each scored two points from Vergil Ortiz and one each from the wins by Thurman, Munguia, Nyambayar, and Kowacki, the difference being one extra point by me from the Kowacki knockout. The boxing challenge returns with two cards that are showcase events despite a few championships being on the line. Fox returns with a PBC card that doesn't excite very many with the comeback from injury of WBA welterweight champion Keith Thurman as the featured main event. Thurman is facing Josesito Lopez, a tough, but generally overmatched at the top ten level. 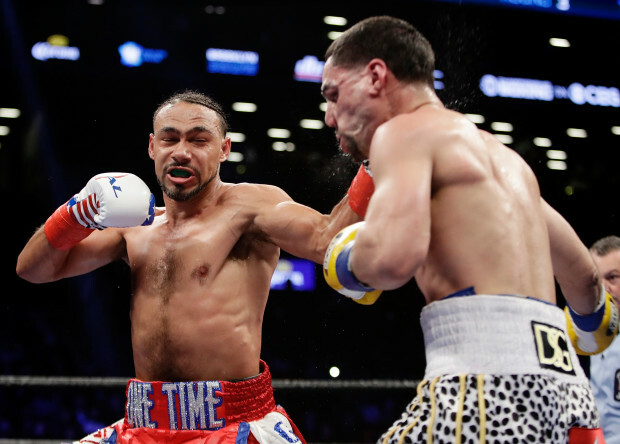 Thurman hasn't fought for 22 months since his split decision win over Danny Garcia and deserves a fight to melt the rust off. 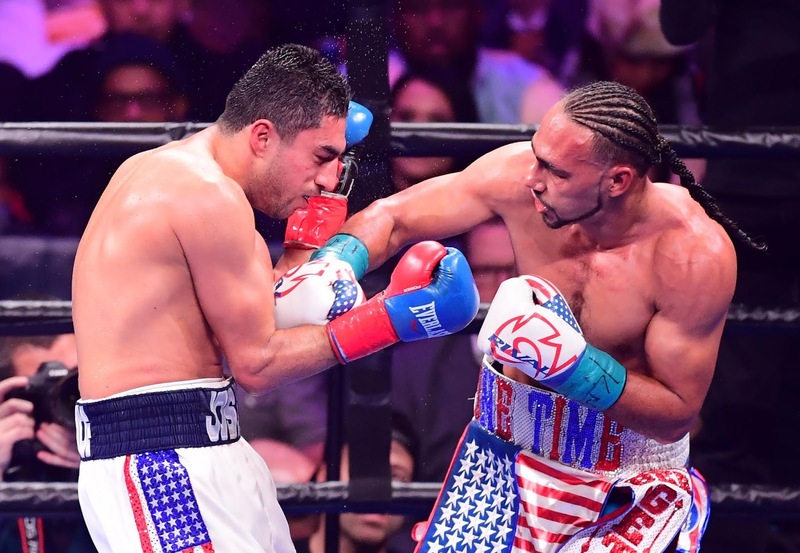 Lopez is the perfect foil for such a match as he'll be competitive enough to make Thurman work, but isn't going to press Thurman too hard for his victory and if he does, it just might tell you what Keith Thurman has for the future. The undercard on Fox is nothing to excited about as far as immediate significance but might pay dividends for eventual contention and could be fun fights. Undefeated heavyweight Adam Kownacki faces former title challenger Gerald Washington in what might be the fight of the weekend as far as action goes. Kownacki is being groomed by PBC for an eventual challenge of WBC champion Deontay Wilder and a win over Washington might be enough to get him that as Wilder (should he win his rematch with Tyson Fury) would be ready for an optional defense. Washington was knocked out by Wilder in the fifth after fighting well for four rounds and was defeated by Jarrell Miller in the fight following his title try. Kownacki defeated former IBF champ Charles Martin by decision in his last fight for his biggest win and he should be able to hurt Washington should he get to him, but the taller and larger Washington could pull this off if he can get Kownacki on the outside. The curtain-jerker is a WBC featherweight eliminator between Claudio Marrero and Tugstsogt Nyambayar. Marrero has stopped two of his last three opponents in the first round sandwiched around a knockout loss to Jesus Rojas, who we'll talk about shortly, while Nyambayar was a decorated amateur and silver medalist in the 2012 Olympics. Nyambayar was very impressive in his last bout with a dominant third round blasting of former title challenger Oscar Escandon and I'm willing to bet that we'll see a similar result against Marrero. DAZN will be live from Houston with a Golden Boy card that doesn't appear to be loaded with competitive fights and the highlight of the night might be how spectacular the knockouts are. Jaime Munguia defends his WBO junior middleweight title against Takeshi Inoue in the main event. The big punching Munguia has a sizable height, reach and about everything else advantage over Inoue, who may share the same last name as "The Monster" Naoya Inoue, but lacks his power and not only has never faced anyone that ranked near the top fifty but has never fought outside of Japan other than one outing in Thailand. Jesus Rojas defends his minor title against Xu Can in the co-feature. Rojas lost his last fight by unanimous decision to Joseph Diaz but retained his minor trinket when Diaz blew the weight on the scales. Rojas knocked out the above mentioned Claudio Marrero in his previous fight before Diaz, while Can has won 12 fights in a row entering this one. Still, Can possesses only two knockouts, isn't likely to hurt Rojas and looks to be far overmatched. Highly touted prospect Vergil Ortiz faces late replacement Jesus Valdez in the opening bout. Ortiz, who has knocked out all eleven of his foes, should look spectacular as Valdez has lost all three times that he stepped up in opposition (Jesus Rojas, Matt Remillard, and Lamont Roach) and the short notice against the talented Ortiz will help his chances very little as well. In the boxing challenge, I lead Ramon Malpica 9-8. Time to catch up with a few passings of late before the list gets too large. The passings list often grows quickly, so I've tried to do a better job recently of keeping the grass mowed so to speak. Goodbye to Kaye Ballard at the age of 93. 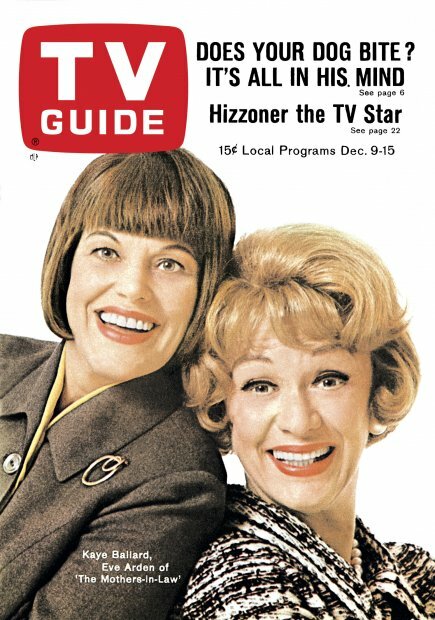 Ballard was a comedienne and actress that was most famous for her co-starring role with Eve Arden on the late 60s NBC show "The Mothers In Law". For a show that only lasted two seasons, "Mothers in Law" had a far long run in syndication than one would believe, but back then television seasons were longer and even average shows had a chance at syndication. Ballard was typecast after "Mothers in Law" and often played the same type of talkative, mouthy character for the rest of her career. Ballard often was used in the theatre, voice-over work and often on game shows and anthology programs such as "Love Boat" and "Love American Style" for the next forty plus years after the end of "Mothers In Law". Goodbye to Mel Stottlemyre at the age of 77 per "Lefty" Koch. Stottlemyre won 164 games for the Yankees from 1964-74 with a career ERA under three. Stottlemyre had the bad luck to be the acc for the Yankees just as the Yankee dynasty was out of gas and moving to mediocre status. Still, Stottlemyre won 20 games three times and lost 20 games once during that time period with 152 complete games and 40 shutouts and one could only imagine his numbers, had the Yankees maintained their elite status. If that had happened, Stottlemyre might have put up the statistics for Hall of Fame consideration. Stottlemyre was known to the next generation of fans as a pitching coach for four teams, including both New York teams, winning four world championships between the Yankees and Mets. Two of Stottlemyre's sons Mel Jr. and Todd pitched in the bigs, with Todd winning 138 in a 13-year career spent mainly with the Toronto Blue Jays. Goodbye to Turk Schonert at the age of 62. Schonert was a long-time backup for the Bengals to first Ken Anderson and then Boomer Esiason in a ten-year career. Schonert was thought of many as a backup that never received a chance to start simply because Anderson was better and when the Bengals drafted Esiason in 1984, Schonert looked to be a starter without a team. It appeared Schonert would be finally given a chance when the Bengals traded him to Atlanta before the 1986 draft for a third round pick, but Schonert was surprisingly beaten out for the job by returning veteran David Archer. Schonert would play eight games in Atlanta, starting five, but threw eight interceptions against only four touchdowns. After the season, the Bengals reacquired Schonert, where he would spend the final three years of his career backing Esiason up and winning his only start in that term in his final season of 1989. Schonert coached quarterbacks for several teams and had spent the last five seasons in the CFL as an assistant with the Montreal Alouettes. Schonert is the answer to one trivia question- Who was the only player in college or pro that John Elway backed up- Schonert, who as a senior in 1979 at Stanford started ahead of freshman Elway. It's been a slow few days here at the home office, but one news note that I found interesting was the San Francisco Giants signing of left-handed pitcher Drew Pomerantz to a one year contract with a guaranteed 1.5 million in salary with 3.5 million possible in incentives. Two things sent my antenna up on the signing of Pomerantz, who spent 2018 battling injuries and ineffectiveness with the Red Sox that saw him make 11 starts and 15 relief appearances on his way to an awful 6.08 ERA. Pomerantz (assuming his health is in order) makes sense as a contender for the fifth spot in the Giants rotation with the loss of Johnny Cueto to Tommy John surgery behind Madison Bumgarner, Jeff Samardzija, Dereck Rodriguez along with the recent signing of returnee Derek Holland as the top four. Pomerantz will likely be challenged by second-year man Andrew Suarez and maybe Ty Blach for the fifth spot and should he win it with a return to his 2017 form (17-6 3.36 ERA in 31 starts), the Giants could have a pretty decent veteran rotation that could either surprise on the fringes of contention or deliver one or more veterans in trade deadline deals for prospects. Pomerantz's best years (other than 2017) have been in Oakland and San Diego- large pitcher's parks and the newly named Oracle Park (coming soon in a post) certainly fits that bill for revitalization for Pomerantz's career. 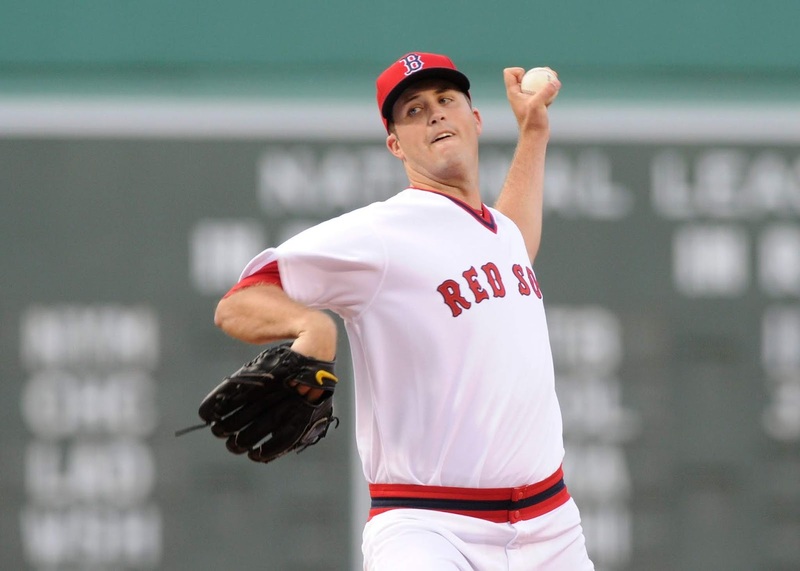 The other was this- what if Pomeranz was installed in the bullpen, either because he was beaten out for a rotation slot or if the Giants thought he would better fill a bullpen need. Here's the interesting part- If you move Pomerantz (or Andrew Suarez, also a lefty) to the relievers, San Francisco suddenly has a ton of quality southpaws there with Will Smith, Tony Watson, Ty Blach and Rule 5 draftee Travis Bergen (should he make the team) and could be in a position to move one or even two of them, perhaps as soon as departure from Arizona to the Bay. Smith and Watson each are very valuable commodities and I could certainly see one traded before the season and the other around the trade deadline. Quality lefthanded relievers with the ability to get righthanded hitters out (they hit .207 vs Smith and .231 vs Watson in 2018) aren't plentiful in the league and could return a quality prospect in a trade or maybe even a position player that might need a chance to play, although the Giants actually have one of those currently on the roster in Mac Williamson, but that's for another day. Perhaps, in a few months, this post could be pretty unimportant as just another non-roster free agent that didn't work out. It could also be very important in either helping to bring in some prospects to the system or even as a piece of a surprise wild card contender. The non-call on Los Angeles Rams cornerback Nickell Robey-Coleman with less than two minutes to go is burning up the sports world to the point when NFL commentators, who often are the softest on criticism of the league, are ripping the officiating and by extension the league. so I do have a dog in this hunt, but not to the level of many. On the third and ten play from the Rams thirteen with 1;45 to play, the Saints were playing for a touchdown even though a field goal gave them the lead. The Rams had two timeouts remaining so a stop would give them a chance, but a first down would likely see three Saint running plays. the Rams using their timeouts and a short field goal attempt by Wil Lutz, one of the league's better kickers. The Drew Brees pass to TommyLee Lewis (not Jones, as I always want to call him) seemed to on the money and the first down might not have been certain, but at where Lewis would have caught the ball, at worst it would have been a 4th and 2 and at best a touchdown. Now watch the play where Robey-Coleman smashes Lewis. 1) Pass Interference- the obvious call, Robey-Coleman arrives a count of two and a half early to hit Lewis. 3) Helmet to Helmet contact- Robey-Coleman comes in on an angle and the side of his helmet makes hard contact with that of Lewis. 4) Illegal Hands to the Face-The main contact is with the helmet, but if you watch the replay Robey-Coleman does extend his arms and connects with the facemask of Lewis. It's the weakest case of the bunch, but still. 5) Unnecessary Roughness- The force of the blow combined with the various contact to the head could be called here for a penalty. If any of those penalties are called, the Saints would have had a first down inside the five and the game is more than likely a victory. Either the Saints score a TD, drain the clock and one or both timeouts and force the Rams to score a touchdown, not the field goal they would kick to force overtime or the Rams use both timeouts and on the final play, the clock runs before the chip shot field goal by Wil Lutz. The Rams would then have 20-30 seconds and no timeouts to drive for the needed field goal to tie rather than the 1;40 and two timeouts that they used in the actual game. Now, many observers are talking about one play not costing you a game and they are right and yet wrong. 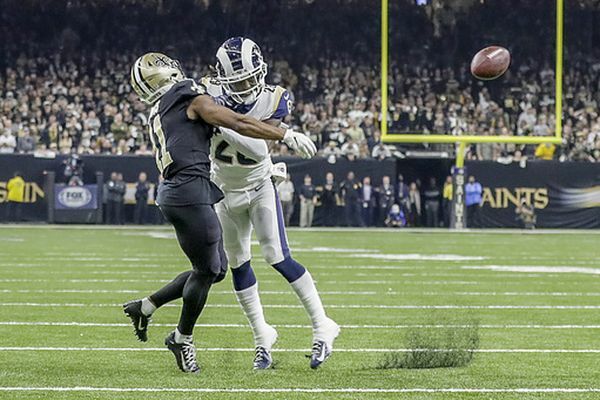 Yes, missed calls happen in every game and even in this one where it was New Orleans getting a break on a facemask against Rams quarterback Jared Goff that forced the Rams to kick a field goal in the fourth quarter rather than a first down deep in the New Orleans red zone,so missed/bad calls happen throughout the game. And it is also true that the Saints blew a 13 point lead and that they settled for two field goals inside the Rams 20 in the first half, only scored three points in the final period and had first possession in the overtime period and all of those factors contributed to the loss. All are facts and yet none of them change this fact- That non-call changed the result of the game. Most of those facts built to that point of the game and the final point came along as a result of the missed call. The Los Angeles Rams win is tainted and will always be remembered as such with a huge asterisk. The Rams players won't give up the win and I wouldn't either, but it is what it is. As for the New Orleans Saints, they know just how they put themselves into a situation to be screwed by the officials. Their play allowed them to be hurt by one bad call, but that doesn't take away this- you spend six months in training camp, exhibition games, a sixteen game regular season and then a playoff game to reach the point of the second most important game of the season. Don't forget the Saints (or fans of any team) fans- they are the people that fill stadiums, buy Red Zone and Sunday Ticket packages, spend tons of money on about anything that you can think of with a Saints logo on it and ask for what? The Saints and their fans (and this applies to all fans and teams) deserved a fair game and one officiated properly. You (and they) deserve that for the time, money and energy spent on the NFL (Or other sports). To have a game called fairly, properly and to have a result that is on the level is not an unfair expectation and the NFL officiating all season has often fallen far short of that expectation. The NFL has a crisis on their hands with officiating and whether it is due to the replay system, part-time officials, officials that have overstayed their time and officials that are beyond their competence. I'm sure their answer to this issue will be as simple as placing the ability to appeal pass interference to the replay system and that won't hurt any, but it misses the bigger problem- officiating deciding games rather than the competitors on the gridiron. Until these issues are addressed, like any unaddressed condition, the problem only compounds itself. Before their pay per view fight, the story had been almost entirely about the typically boorish behavior of Adrien Broner and only a little about the skills of 40-year-old Manny Pacquiao. The questions now are these- just which PBC star will Manny Pacquiao face next and when will PBC realize that Adrien Broner is simply not an elite level fighter and when will their promotional company stop presenting him as such? Manny Pacquiao threw more punches, landed the harder punches and was never threatened in a unanimous decision victory that some scored as a shutout. I scored it 118-110 and it was surprisingly closer on the official cards, but the easy win opens up Pacquiao several avenues to choose from for his next fight. There's always the rumors of a Floyd Mayweather return, but in hoping that never happens, Manny still has options. Fights vs WBA champion Keith Thurman (Pacquiao holds a WBA minor title) and WBC champion Shawn Porter are possible as could be one vs Danny Garcia, who always seems to be in the thick of these events, much like Adrien Broner (more on him in a bit) and could be of interest. IBF champion Errol Spence would be a huge challenge, should he defeat Mikey Garcia, but I'm doubtful we ever would see a Spence-Pacquiao fight as many of the reasons that Pacquiao left Top Rank was an unwillingness to face Terence Crawford so Spence wouldn't be as equal of a reward as the risk. Mikey Garcia is a possibility, especially if he upsets Spence as the two are close to the same natural size, might make the exciting fight of the bunch and would be an attractive PPV event. 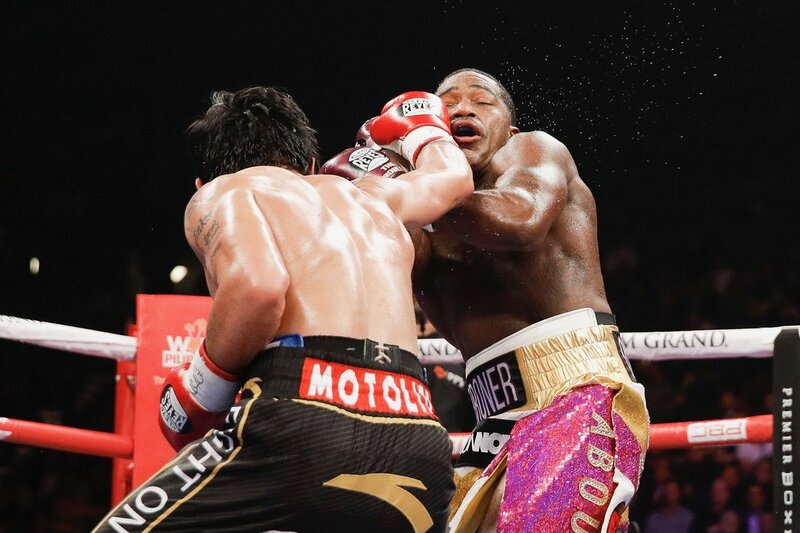 Manny Pacquiao showed enough in victory to remain viable, but Adrien Broner did not. Broner, who despite a watered down "four division champion" resume' line has never decisively beaten a fighter better than Antonio DeMarco, has some 'arguable' decision wins over the likes of Daniel Ponce DeLeon, Paulie Malignaggi, Adrian Granados and a really questionable draw vs Jessie Vargas and losses against every top opponent he has faced (Marcos Maidana, Mikey Garcia, Shawn Porter and now Manny Pacquiao) continues to receive sizable paychecks and big fights despite mouth that delivers more in the press conference that he ever brings to the ring. Broner's awful treatment of Al Bernstein and racist statements towards the Pacquiao camp were bad enough, but his effort, which showed a sturdy chin and nothing else, was lacking until his delusional post-fight conduct where he hollered about whipping Pacquiao for "The Hood", screaming about being robbed and talking about beating up 60-year-old Showtime interviewer Jim Gray, seemed more aimed at being a character rather than a fighter. If we see Broner anywhere near a big fight again, PBC needs to take a deeper look at their managemental decisions and perhaps "The Zabbies" may eventually be renamed "The Bronies"! In the co-feature, former Olympian Marcus Browne dominated and busted open Badou Jack in winning a unanimous decision (116-110 on my card) to win a minor title. Browne boxed very well off the jab and clearly controlled the fight, but his best shots were a right hand that seemed to hurt Jack in the fifth and a headbutt that left a vertical cut down Jack's forehead which gushed as much blood as you'll see in a boxing ring. his chin has been shown to be questionable and I still think he received a gift split decision against Radivoje Kalajdzic, in a decision that was as bad you'll see. Browne now holds a WBA minor title and will eventually face their true champion Dmitry Bivol down the road. In the other challenge bout, Nordine Oubaali won the vacant WBC bantamweight title with a competitive, yet clear unanimous decision over Rau'Shee Warren in a pairing of southpaws. The fight was a rematch of their 2012 Olympic fight, which was also won by Oubaali, who marched forward with a strong right hook and is in a position to be the only bantamweight title that will not be held by the winner of the World Boxing Super Series in the division. The Jhack Tepora-Hugo Ruiz fight was canceled when Tepora was far overweight at the weigh-in. In the boxing challenge, Ramon Malpica earned four points to my wo on the evening. Ramon added two points each from the Pacquiao and Oubaali wins, while both of my points were due to the Pacquiao win. I lead the challenge 9-8. Friday night was looked at as a mere appetizer for the Manny Pacquiao- Adrien Broner PPV slate on Saturday, but instead, each network involved promoted what turned out to be a major upset that will shake up future fights in their division. Demetrius Andrade retained his WBO middleweight title for the first time with a final round stoppage of Artur Akakov in the Madison Garden Theatre (formerly known as the Felt Forum). Andrade issued his typical performance, using his jab that kept Akakov puzzled all evening and entered the final round up nine rounds to two on my card before Andrade mildly buzzed Akakov with a right hand with 45 seconds remaining. Surprisingly, referee Arthur Mercante Jr stopped the fight over the severe protests of Akakov and the stoppage seemed very premature in my opinion. Andrade called out Gennady Golovkin after the fight, but I'd be surprised that would be next, even if Golovkin selected DAZN as his television home, Andrade is high risk, little reward and wouldn't make very much sense, if the end game is a third fight with Canelo Alvarez. I would guess that Andrade would next face another contender of Akakov's level, which is in the top 15 range depending on the organization, although the eventual big fight might be former WBO champion Billy Joe Saunders, who was stripped of the title last fall for failing an illegal substance test before a title defense vs Andrade. Former three division champion Jorge Linares was expected to take another step towards a junior welterweight title fight against WBC champion Jose Ramirez and all Linares had to do earn that shot would be to defeat veteran fringe contender Pablo Cesar Cano in the co-feature. Less than one round and three knockdowns later, the title fight possibilities and possibly the career of Linares was finished with Cano pulling the upset of his career. For all the talent and offensively tremendous skills that Linares has always possessed, Linares has always had a less than sturdy chin and when this fight started, Cano looked like a fighter far larger and Linares didn't have a chance as the first punch Cano landed sent Linares to the mat. Linares never seemed to regain his equilibrium and despite landing some shots against the charging Cano, was unable to repel his aggression in being knocked down two more times with the fight being called after a woozy Linares rose to his feet on unsteady legs. This might be all she wrote for Linares, who Steve Kim has called arguably the most brilliant and flawed fighter of his time. Linares clearly isn't strong enough to hold off 140 pounders and dropping back to lightweight either may not an option in making weight or after this loss, a Vasyl Lomachenko rematch or a talked about fight for years against Mikey Garcia would be highly unlikely. As for Cano, he'll receive the chance to face Jose Ramirez for his WBC title and attempt to add another surprise victory to his record. IBF junior featherweight champion T.J. Doheny defended his championship for the first time against overmatched late substitute Ryohei Takahashi by an eleventh round knockout. The stoppage seemed a little soon to me (Not nearly as bad as the Andrade-Akakov ending later in the evening), but Doheny had won every round and even though Takahashi never stopped moving forward, one could argue enough was enough. I liked what I saw from the technically strong Doheny and I think the possible All-DAZN unification fight with WBA beltholder Daniel Roman could prove to be a very even fight. Meanwhile, on the other end of New York state in Verona, Heavyweight Bryant Jennings looked to cement himself as a possible challenger to champion Anthony Joshua with a win over Oscar Rivas. Jennings entered the fight as the number two contender in the WBO and assuming he continued winning over the average competition he had been facing since his loss to Luis Ortiz, he would eventually receive a title shot. The undefeated Rivas had fought every fight of his career in Canada and against no one of note and no one knew what he would bring in his first fight against a contender. I had Jennings narrowly ahead entering the final round (6-5 in rounds) and the ESPN+ broadcast flashed a graphic that stated Rivas did not land more than nine punches in any of the previous eleven closely contested, but not visually thrilling rounds. The Rivas corner screamed at their man that the fight was on the line and he needed a big twelfth round and how many times in boxing do we hear that and watch the fighter shuffle along to take his chances on the cards? Rivas listened and roared from his corner with a rage unseen and pounded Jennings with a series of rights that sent Jennings to the canvas. Jennings barely beat the count and couldn't hold off Rivas, who drove Jennings into the ropes with a volley of bombs that forced the referee to end the fight. Rivas will likely zoom to near the top of at least the WBO rankings, if not other organizations as well and we could see more of him in a top loaded heavyweight division. For Jennings, he'll have to start over, which might be a daunting task and he'll likely have to face tougher competition to speed that process along. Olympic silver medalist Shakur Stevenson looked sensational in winning the first three rounds and then stopping Jessie Rosales with one straight left. Stevenson is ready for a jump in competition. In the boxing challenge, I earned six points to Ramon Malpica's three to lead the boxing challenge 7-4. I added three points from Shakur Stevenson (win, knockout and bonus point for the round), two points from T.J. Doheny and one from Demetrius Andrade. Ramon picked up one point from each of those wins. An early start to the boxing challenge this week with two fight cards on Friday before a pay per view broadcast Saturday night that will end a nine-fight challenge for the true kickoff for the 2019 boxing calendar. 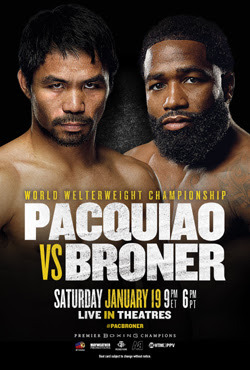 The biggest fight of the weekend occurs in Las Vegas as Manny Pacquiao makes his PBC debut with his minor title defense against Adrien Broner. Pacquiao looked very strong in his win over Lucas Matthysse and seemed to have spring in his step, but Matthysse was a spent force and an impressive win over Broner could move him into several fights in the mostly PBC controlled division. Broner, who despite winning championships, has never defeated an elite fighter, but still has been very competitive in his three defeats and should make this a fight worth paying attention to, if not action-filled. The undercard has a very interesting fight for a minor light heavyweight title between Badou Jack and Marcus Browne, Rau'Shee Warren faces Nordine Oubaali in an Olympic rematch for the vacant WBC bantamweight title and Jhack Tepora vs Hugo Ruiz for a minor featherweight title. Jack vs Browne is the most interesting to me as Jack battled to a draw with Adonis Stevenson in his previous bout in which he moved up from super middleweight while former Olympian Browne has shown a big punch and a questionable chin in his young career. Friday night, ESPN+ and DAZN battle each other with streaming cards at the same time. DAZN has more important fights, if not the most interesting with the main event showcasing Demetrius Andrade defending his WBO middleweight title against Artur Akakov from the small hall known as the Madison Square Garden Theatre. Andrade returns less than three months after his victory for the vacant title, which is the good news for the often inactive champion. The issue is the opponent in Akakov, who dazzled few in his only fight against a top ten opponent in Billy Joe Saunders and might make this a dull fight. Andrade could use an exciting finish as his belt will be the only title not owned by the winner of May's unification fight between Canelo Alvarez and Daniel Jacobs, so if he'd like a big payday against the winner, an exciting performance would help. Jorge Linares fights for the second time since his loss to Vasyl Lomachenko, this time against veteran Pablo Cesar Cano in an eliminator for the WBC title at 140 pounds vs champion Jose Ramirez. Linares usually gives an exciting performance with a high wire act due to his sometimes wobbly chin and Kleenex like skin and while Cano usually comes up short against top competition, Cano did defeat Mauricio Herrera two years ago, so this isn't quite a squash match. Undefeated T.J. Doheny makes his first defense of the IBF junior featherweight title against Ryohei Takahashi. Doheny won his title in Japan last time out after a decision win over Ryosuke Iwasa and a win here over Takahashi, which seems likely, might earn him a unification fight against WBA champion Daniel Roman, which would be very easy to make with both being DAZN/Matchroom promoted. I'm looking forward to seeing Doheny, who is from Ireland, but now makes his home in Australia. Jennings, who hadn't fought anyone of note since his back to back losses to Wladimir Klitschko and Luis Ortiz on 2015 until his exciting brawl with Alexander Dimitrenko that ended with a Jennings ninth-round knockout that saw both men hit the floor in the fight. Rivas hails from Colombia but has fought all of his previous fights in Canada, so who really knows what he'll be bringing to the ring. Shakur Stevenson takes a jump in competition vs Jessie Rosales from the Philippines. Stevenson overwhelmed Viorel Simion in one round last time out and is starting to become a more exciting fighter to watch. Rosales has built his record overseas and in his only North American fight (Mexico) was knocked out in two by Jhonny Gonzalez, so he's likely to be overmatched by the fast-fisted Stevenson. In the boxing challenge, Ramon Malpica and I are tied at one point each. When the AFL merged with the NFL, the divisional setups needed to be realigned after the Cleveland Browns, Pittsburgh Steelers and Baltimore Colts all moved to the AFC. 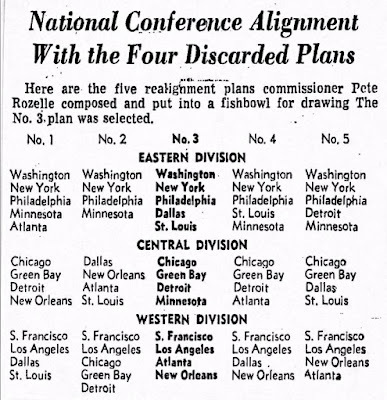 The various interests involved couldn't agree on which of the five plans to accept and the official word is after many long discussions that commissioner Pete Rozelle pulled the eventual slip out of five choices. I'd be surprised if Rozelle didn't prefer the grouping that was selected and "might" have bent a corner or another identifying characteristic to find the one that he wanted, much as the urban legend of the "bent corner" that David Stern allegedly found on the envelope of the New York Knicks in the first lottery drawing to deliver Patrick Ewing to the Knicks. The divisions would remain in this lineup until the 2002 season where there were some minor tweaks that were needed after various expansions. The interesting part of these are the rivalries that could have been and the rivalries that occurred via the only possibility of the five. The Dallas-Washington rivalry that developed starting with the Tom Landry Cowboys against the George Allen Redskins was only listed on the eventual winner. The Green Bay-Minnesota rivalry between neighboring states was also only an option on the winning option and had an eighty percent chance of not occurring as well. The Atlanta-New Orleans rivalry would have been lost on two of the five chances. The Redskins, Eagles, and Giants were one group guaranteed to stay together, as were the Bears and Packers along with the Rams and 49ers, so there must have been some type of agreement for some franchises to stick together. The Vikings had an eighty percent chance of being with the Redskins, Eagles and Giants and the Packers were listed on none of those slips. The rivalries that we could have taken for granted and instead never happened are even more fun to think about. Yes, we could have lost Cowboys-Redskins, but on two choices, the Cowboys would have been in the same division as the 49ers and Rams. Imagine Tom Landry's Cowboys playing twice a year vs Chuck Knox's Rams in the '70s and then the early '80s against the 49ers of Bill Walsh and Jimmy Johnson's Dallas teams of the early '90s against the Steve Young/Jerry Rice Niners. Another side of losing Cowboys-Redskins that could have been a positive would have been the Minnesota Vikings with new rivalries. I bet the Bud Grant Vikings against George Allen's Redskins would have been a really good one and would have progressed into the 80s when the Vikings had good teams under Grant and Jerry Burns against the Joe Gibbs era Redskins. The Vikings of the 80s and 90s would likely have developed something with the New York Giants with both teams being at the top of the league. The Falcons and Saints would have been far different in the two scenarios without each other. The Falcons would have been in the Eastern with the three-team block and the Vikings with the Saints with the Central block with Chicago, Green Bay and Detroit as a real fish out of water. In the other, it would have been the Falcons in the Central with the Saints aligned with the Rams and 49ers in the Western Division as they would be in the real-life NFL, but with Dallas, who they would have looked at as a rival, but would have spent years getting swatted aside by the Cowboys. 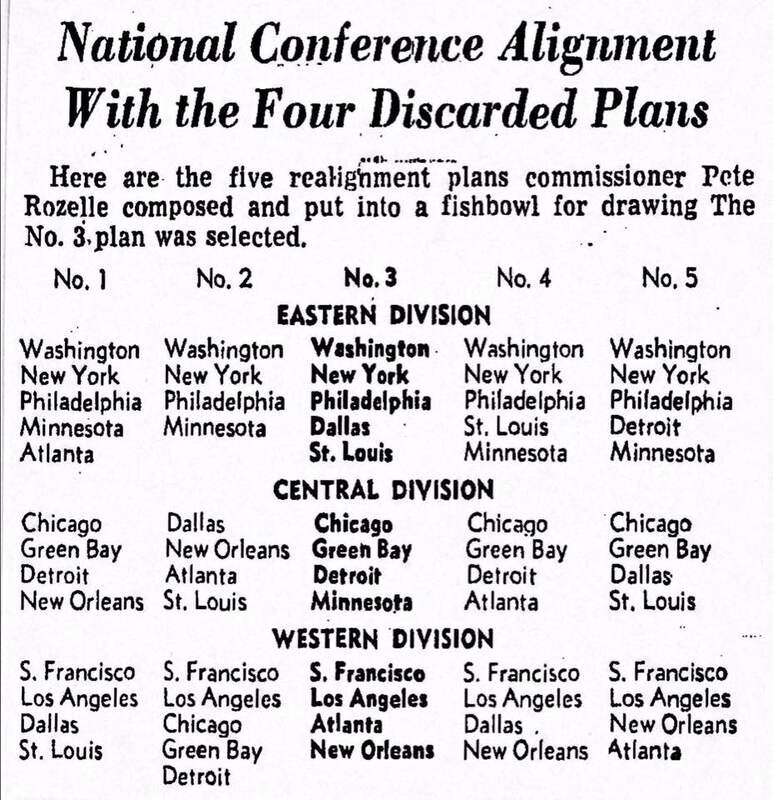 The biggest loser seems to be the St.Louis Cardinals, who in two possibilities would have had their best teams in the 70s with Don Coryell with weaker teams ( New Orleans and Atlanta still building off expansion) and (Chicago and Green Bay in a time that both teams were at their weakest) and even though they would have been in the same division with Dallas in both, it brings interesting thoughts. Could the Cardinals have been the big rival to Dallas that Washington became? If the Cardinals had become a perennial contender, could the Cardinals have remained in St.Louis and assuming that happened, Don Coryell never leaves and what happens to the Air Coryell Chargers without Don Coryell? If the Cardinals stay in St.Louis, what team moves to Arizona or does the Valley of the Sun wait for expansion and which expansion team would have been muscled aside- Carolina or Jacksonville? Football history decided with the luck of the draw. The 2018 Hagerstown Suns weren't overloaded with prospects as last place teams rarely are, but even though the Suns may not have produced a pitching prospect on the same level as infielder Luis Garcia, they had a few more players worth a look for next year's system prospect list. The top pitcher that spent most of his year with the Suns was Jackson Tetrault, whose initial numbers look just average until you dig deeper. Tetrault's numbers after two months were terrible (0-6 with an ERA of over six) and then suddenly turned into an excellent starter. Tetrault's second half finished with an ERA of 2.63 in nine starts and earned him an August promotion to High A Potomac. SAL hitters hit .290 against Tetrault in the first half and only .217 in the second and for the season, Tetrault notched 118 strikeouts in 110 innings, which gives him a positive number in my favorite pitching statistic for future success for Low A pitchers and walked only 34 in his Hagerstown time. At 6'5 and just 175 pounds, Tetrault is likely to grow into his frame and wasn't too old for the level as he spent the season at 22. Tetrault's far from a sure thing, but he's definitely worth following. Nick Raquet pitched well (2.79 ERA, two complete games in twelve starts) for the Suns, but the 2017 third rounder from William and Mary (and five other guys, I love that joke!) struck out only 56 in 67 innings and was the type of polished college pitcher that should do well in the SAL. The general rule of thought was correct as Raquet allowed opponents to hit .319 against him in twelve starts in the Carolina League and his ERA almost hit five. Raquet's ceiling might be as a long or situational reliever, but I'm still interested in Raquet's 2019 season. Brigham Hill returned from a 2017 injury to pitch well in ten starts in the second half. Hill's season looked a lot like that of Nick Raquet, a polished college pitcher that did what he should against the level of competition. Still, Hill didn't miss a lot of bats (35 SO in 49 innings) and I wonder how his stuff will play (like Raquet) as he rises through the system. Andrew Lee returned from injury and split his season between the rotation (10 starts) and the bullpen (10 appearances). Lee's stats were similar to pre-injury Lee- 86 strikeouts in 67 innings and an opposing batting average of .166. At 25, Lee could have just overmatched younger hitters, so it'll be interesting to see Lee next year in High A Potomac or AA Harrisburg, but he has the type of arm that might be best used as a gas thrower out of the bullpen. Two middle round college picks in the 2017 draft were impressive in Hagerstown, but quickly moved on and impressed in Potomac as well. Auburn's Ben Braymer posted an ERA of under two in seven Hagerstown appearances before splitting time between Potomac's rotation and the bullpen. Braymer's interesting with a combined ERA of 2.28, 118 strikeouts and an opponents average of .219 and should start in AA Harrisburg. Jeremy McKinney looked like roster filler as a 31st round pick in 2017 from Indiana State entering the 2018 season. That was until McKinney didn't allow an earned run in eleven innings from the Suns' bullpen and then struck out 36 batters in 33 innings in Potomac with an ERA under two. Can McKinney continue this performance at the next level? We'll see, but if he can post anything near those numbers in Harrisburg, he'll be a bullpen candidate for someone, if not Washington. Kyle Johnston was a higher draft pick than Braymer and McKinney, but his numbers weren't quite as strong. The former Texas Longhorn still allowed opponents to hit a combined .237 between Hagerstown and Potomac. Johnston pitched more from the pen for the Suns than the rotation but reversed that order for when assigned to Potomac. I see Johnston as a reliever in the future, but the Nationals may differ with that conclusion. Former number one pick Seth Romero finally arrived in Hagerstown and struck out 34 batters in seven starts and opponents barely hit .200 against him. Romero underwent Tommy John surgery and will miss the 2019 season. The Suns otherwise featured more suspects than prospects. Three of the four pitchers with the most innings pitched (Jackson Tetrault was the other) look to be organizational soldiers at this point. 20-year-old Tomas Alastre finished with an ERA over five, allowed 21 homers and struck out only 80 in over one hundred innings. Alastre was a little young for the league, so give him one more season, but 2018 didn't look great for his future. Jackson Stoeckinger's numbers were even worse than Alastre's and he'll also likely receive another chance in Hagerstown, while Sam Held improved in his second year as a Sun, pitching as a reliever and occasional starter, but his improvement wasn't enough to leap him forward as a true prospect. 2018 draft picks Tim Cate (2nd Connecticut) and Frankie Bartow (11th Miami Fla) each arrived late in the season, but with limited innings, it was hard to evaluate them. Either or both could start in High A Potomac next year or start back with the Suns. There isn't a sure thing in this crop of pitchers, but there are a few worth considering. The Seth Romero injury robs the system of arguably the best toolbox in the system for 2019 and if one of those college draftees that performed well from the bullpen can repeat those numbers in AA, the Nationals would be pleased. Still, none of these are true blue chippers (other than Romero) , all could be off the prospect charts at this time next year and Washington could be wondering just how they do so well in Latin America, yet draft so badly. 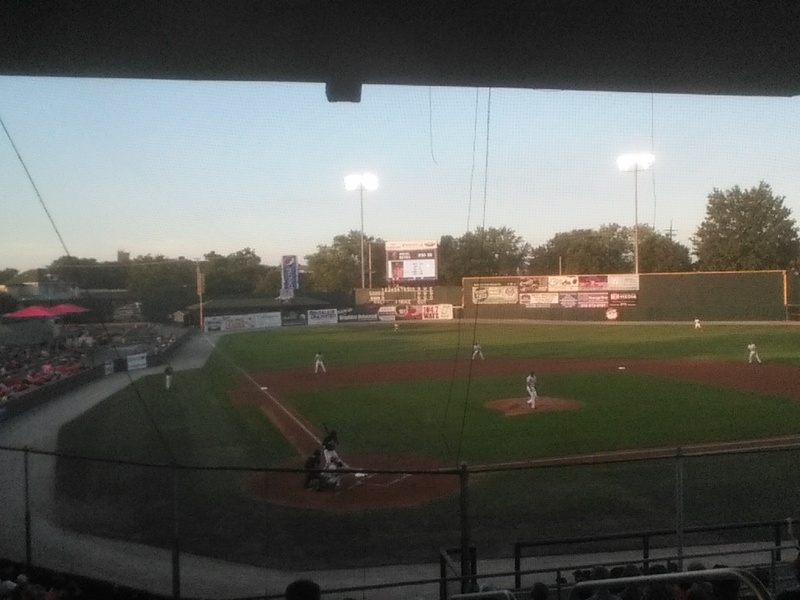 I'm way overdue with this, but with spring training coming in a month or so, I wanted to look back at the 2018 Hagerstown Suns, a team that in April was as good as they were going to get and as far as seeing prospects, one could have, with a few exceptions, concentrated on the visiting teams. I was intrigued more with the pitchers than the hitters and I'm going to focus on a few players more than covering all players as I did in the past. The prospect list is short and about what you would expect from a team that recently has been selecting at the bottom of the first round and one that finished last in both halves in their division and won eight fewer games overall than the team above them in the standings. 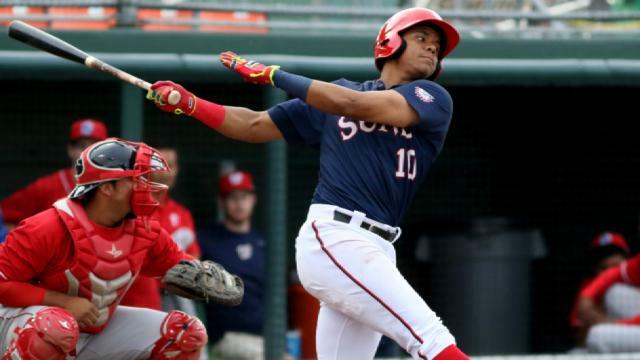 Basically, the highlight of the Hagerstown Suns season came and went by in the first three weeks of April when Juan Soto demolished SAL pitching for a sixteen game span that had to be seen to be believed. Walk-off homers, game-winning hits and baseball bouncing off bats with sounds that haven't been heard in Municipal Stadium for years, Juan Soto's two homestands here had to be seen to be believed and the few fans that were able to see those games certainly won't forget them any time soon. Soto traveled from Hagerstown to Potomac to Harrisburg to Washington in a six-week span and his five Hagerstown homers in sixteen games were exactly half of the Suns' team leader (Kameron Esthay) for the season, who hit his total in 334 at-bats. Soto will be the player that will allow Nationals fans to feel a little better about the possible (of this writing) departure of Bryce Harper this winter. We conclude the top hitting prospects with Luis Garcia, who hit .297 with three homers in 78 games with the Suns before a promotion in July to High A Potomac. I really like the ability to make contact as his "hit tool" and the only two questions that I would have will be long-term power potential (will he be a 12 homer guy or a 20-25 homer player?) and where will he play over the long-term? My guess currently is maybe on the power potential and I lean towards Garcia having a chance to stay at shortstop with second base being slightly more likely as he moves up the ladder. Garcia turns 19 in May and all things considered, had a strong 2018 and I would rate him as the Nationals second best prospect in the system behind Carter Kieboom ( I don't consider Victor Robles on my list, although many still do). I do have two other players that are worth keeping tabs on with first/third baseman Omar Meregildo leading the way. At 21, Meregildo wasn't young for the level as Garcia, but not excessively old either. Consider me interested in watching Meregildo in 2019 to see if he could be a potential contributor or a Bryan Mejia type that caught fire for a few months in Hagerstown. Yasel Antuna played the season as an eighteen-year-old and entered Hagerstown as the more heralded prospect between himself and Luis Garcia. Antuna ended it with a .220 average, an astoundingly bad 29 errors, a season-ending injury that required Tommy John surgery after some of what we'll kindly state as indifferent play. Antuna's still worth noting, but he's going to have to show much more than he did in 2018. The rest of the hitters? I just don't see much to be excited about. 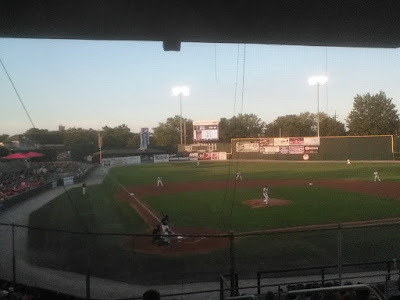 The Suns had one player hit double figures in homers-Kameron Esthay with 10, the team leader in RBI, Jake Scudder with 55, hit only .244 and outside of Soto, the only player that hit above .300 (Branden Boggetto in 29 games,)was promoted to High A Potomac and was later released. Considering that, a few of the "Highlights' as follows. You would expect true prospects returning to Low A to tear the league up and earn quick promotions. Aldrem Corredor (.289/4/30 in 187 at-bats) and Nick Banks (.260/6/27 in 200 at-bats) both earned promotions, but neither looked sensational doing it. Corredor reminds me of the many first basemen from the system of late, a decent average, little to below average power and levels out at AA. Banks starts next season at 24 and looks like a career AA player to me. Alex Dunlap was a little old for the level (turned 24 after the season ) and coming out of Stanford, should have hit well. Dunlap struggled with injuries and only played 35 games with all but two of them after the end of June. Still, Dunlap's five homers in that period show a reason for some mild hope. Cole Freeman's line of 266/3/43 was average but was the latest of the Nationals college infielder type that plays multiple positions, runs well (26 steals), plays hard and stays around for a while, but is an AA/AAA level player. The Nationals always seem to draft this type of player and they rarely make an eventual impact. Jake Scudder led the team in RBI (55) in 85 games, which is the good news. The bad was he hit just .244 and with seven homers for a college prospect didn't move him up the ladder for me. Scudder turns 24 before the season starts. Kameron Esthay's ten homers led the team, but hit a mere .216 and struck out 126 times in 334 at-bats. Just isn't going to make enough contact. Only three other players finished with more than 200 at-bats. Armond Upshaw stole 24 bases, but otherwise hit just .234 with only two homers at the age of 22. Anderson Franco returned to Hagerstown and notched another unimpressive line (.237/3/34 in a half-season of play. Alex Flores hit .216 with six homers in 213 at-bats and was selected from Washington by Houston in the AA phase of the Rule 5 draft. I'll be trying to post the pitchers in the next day or two and there will be a pitcher or two that I like and might have a chance to surprise in 2019. 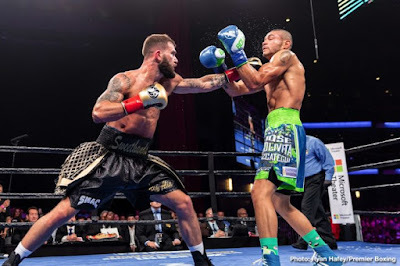 Caleb Plant won all the early rounds and took advantage of an off-balance Jose Uzcategui twice to score flash knockdowns that gave him an insurmountable lead on the scorecards before using the boxing version of the "Four Corners" (Phil Ford was unavailable for comment) to run out the clock and upset Uzcategui and take away the IBF super middleweight title. Uzcategui won the final five rounds on my scorecard, but the knockdowns put him so far behind Plant that he won those rounds mainly due to desperate aggression. Even though Uzcategui knew he needed a knockout to win, he still didn't move his hands enough to seriously hurt Plant, who protected his lead with holding, grabbing and clutching a frustrated Uzcategui. Plant's win and performance came as a surprise to me ( I had Plant a 115-111 winner) and I'm still not sold on him in the long run as he seems to be a very beatable champion. However, he has plenty of room to improve, isn't in an overwhelmingly strong division and fights for the PBC, which means he'll likely be matched very carefully until an eventual mandatory bout. My guess is that if Anthony Dirrell (PBC) wins the vacant WBC title over Avni Yildrim, they'll build for a Plant-Dirrell fight in the usual PBC manner in which both fighters will fight two showcase fights and take a year to eighteen months to build for a fight that few are hungering for anyway. As for Uzcategui, a fighter that was highly thought of by many and avoided by many as well, this was a very disappointing outing and he'll have to start over because he still won't be a likely opponent for top fighters because of his ability when he's at his best. This was still a setback for Uzcategui, who had a national showcase and the ability to fight fighters from any promotional unit or network and whether due to overconfidence or a lack of preparation, came up lacking on a night that he could have made a huge statement. In the co-feature, Brandon Figueroa was very impressive in a three-round crushing of Moises Flores in a junior featherweight eliminator. Figueroa punished Flores from the opening bell and sent him to the floor with a left hook in the third round. Flores rose but was hit with a volley of punches that culminated with a right hand that dropped Flores into a corner where the referee called off the bout. Figueroa will now be the mandatory contender for WBA champion Danny Roman in what should be an interesting mix of styles and a very good matchup. I slightly favor Roman in that one, but it's very close between the pair. It's time for a brand new year in the boxing challenge as I take on Ramon Malpica in picking the best fights in boxing. I've won three challenges in a row after dropping the initial challenge to Ramon, so I'm looking to make it four. The two fights are Sunday night on FS1 and the PBC with one being the first world championship fight of the year. 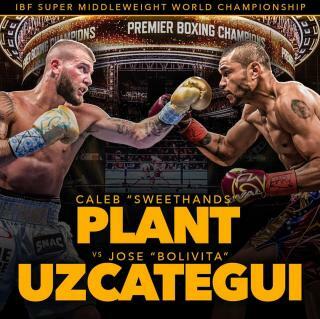 The main event has the improving IBF super middleweight champion Jose Uzcategui in a mandatory defense against Caleb Plant. Uzcategui delivers exciting fights in an attacking style and disposing of Plant in front of a national television audience could be the beginning of a big year for the big punching Venezuelan, who can move around the big three promoters/networks without a formal affiliation and could fight any of the other champions at the weight (Gilberto Ramirez WBO/Top Rank, Callum Smith WBA/Matchroom/DAZN and the winner of the vacant WBC title fight pairing Anthony Dirrell PBC and Avni Yildrim unaffiliated). While I really like Uzcategui against the marginally qualified and tedious to watch Plant, who has one win of note (a decision win over the shopworn Porky Medina), I'm a little cautious with this one. PBC has often featured Plant on their broadcasts in preliminary bouts so they have a small investment in him, he's a noted mover (I'd say runner, but hey it's a new year) and this being on a PBC card, I have a bad feeling that this is going to be far closer on the cards than it might be in the ring. In other words, I could see a scenario where Uzcategui wins ten of twelve rounds, chases Plant all evening and the house fighter wins a ridiculous decision complete with his girlfriend (PBC reporter Jordan Hardy dates Plant) interviewing him as the crowd boos loudly. The other challenge bout will be a WBA junior featherweight eliminator between undefeated prospect Brandon Figueroa and former world title challenge Moises Flores. Both fighters have defeated former contender Oscar Escandon, with Figueroa looking very impressive in stopping Escandon in his last outing in September. Flores lost a decision to WBA champion Danny Roman last June and a win here would set him up for a rematch. Former WBA champion Guillermo Rigondeaux returns in a non-challenge bout against trialhorse Giovanni Delgado on the card in his PBC debut. Rigondeaux hasn't fought since his first loss in December 2017 to Vasyl Lomachenko. 2019 didn't get off to a great start with two passings already on January 2nd. 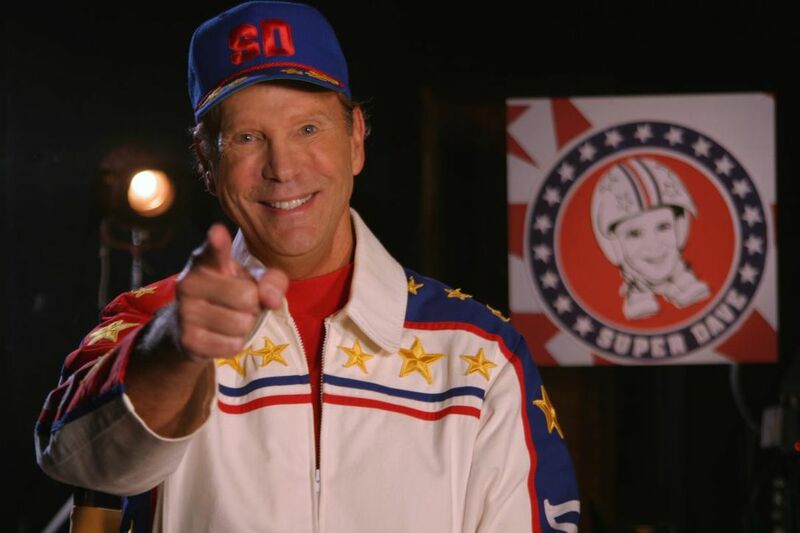 Goodbye to Bob Einstein, who passed at the age of 76. The comic was known best in recent times for his character on "Curb Your Enthusiasm", but to me, Einstein, the older brother to actor Albert Brooks, will always be "Super Dave" Osborne, the stuntman that never found the stunt that he could pull off successfully on three different programs "Bizarre", "SuperDave" and most recently "SuperDave Spiketacular". I loved Super Dave and I could never stop laughing at those shows. They hold up well and I think it's because all of us know "that guy" that jabbers and jowls about what they are going to do and what they have done and yet are just too inept to do almost anything. Einstein was also a writer for many programs in the 60s and 70s with an Emmy for best writer for the Smothers Brothers show in 1968 and a Cable Ace award for the SuperDave show on Showtime in the 80s, but he'll always be Super Dave in my memories. Goodbye to Gene Okerlund also at the age of 76. "Mean Gene" was the main interviewer for the Midwest-based AWA before moving to his greatest fame with the WWF before wrapping his full-time career up with WCW. Okerlund would make occasional appearances with the WWE after their purchase of the WCW. Okerlund was dubbed "Mean Gene" by either Hulk Hogan or Jesse Ventura, depending on the source you read or whom you talked to of Hogan or Ventura. I never thought Okerlund was all that great at calling the action in the ring, but few were able to match his ability doing interviews and promos with the stars. Okerlund had a manner of speech and body language that the viewer could snicker at as he played the straight man or the smart-lipped counterpuncher to the heels that almost slipped by them and you and as they would turn to confront Okerlund, he would smoothly change the subject. Gene Okerlund might not have been the best wrestling announcer of his time, but with the possible exception of Jim Ross, he certainly was the most known by the mainstream fan and best remembered as well. Goodbye to Ben Coleman at the age of 57. Coleman was the starting center on the only ACC Tournament championship team that Lefty Driesell ever coached in 1984 and averaged 15 points and eight rebounds in his two seasons as a Terrapin. Coleman arrived after two years with Minnesota and his transfer to College Park enabled the Terrapins to replace Buck Williams as the undersized (in height) yet burly center against the larger centers such as Ralph Sampson, Brad Daugherty etc that populated the league. In the game below, Coleman scored 26 points in an upset over Daugherty, Michael Jordan, and North Carolina in 1983. Coleman would play for four NBA teams and spent time playing in Europe in his pro career. Goodbye to Jerry Buchek at the age of 76 as Lefty Koch sends word. The light hitting second baseman spent time with the Mets and Cardinals from 1961-68, never hitting higher than .247, although he did hit 14 homers as a Met in 1967. Buchek was a member of the 1964 world champion Cardinals, singling in his only plate appearance and scored the first run in Busch Memorial Stadium in 1966. Goodbye to Kwamie Lassiter at the age of 49. Lassiter spent time with the Chargers and Rams but was best remembered for his time with the Arizona Cardinals from 1995-2002. In the 1998 season finale' and the Cardinals needing a win over the Chargers to clinch their first (non-strike) playoff spot in 22 years, Lassiter intercepted four passes in a 16-13 Cardinal win. Goodbye to Alexis Smirnoff at the age of 71. Smirnoff was never quite the level of "Russian" star as Ivan Koloff or Nikolai Volkoff during the same time period but was a solid middle to upper card wrestler that spent time in the WWF, AWA and many various NWA promotions. My best Smirnoff memory was in the dying days of Verne Gagne's AWA, which was only kept alive by a contract with ESPN and resulted in the AWA being populated by recent graduates of their wrestling school, veterans who were winding down their careers and veterans who were on the blacklist with WWF and WCW. Smirnoff was in the second of the three tiers and arrived in a tag team with a gentleman named Gordienko, who the promotion never bothered to give a first name and pushed them as the "best Russian team in the world", despite their matches taking place at the same speed as a slug in the sunshine. The funniest part was their post-match interviews that featured Gordienko speaking the same answer to every question "You know why we're here". Gordienko said this so much, that you had to think this was going to eventually mean something, although considering the AWA at the time, that something would have likely meant either nothing or nothing of importance. Sadly, there are no clips of these on YouTube, so you'll have to settle for a match instead and for the record- We never were told just why they were there. Finally, Goodbye to Verna Bloom at the age of 80. Bloom was a character actress that appeared in High Plains Drifter, but will best be remembered as "Marion Wormer", the drunken wife of the dean of Faber College in Animal House that slept with Eric"Otter" Stratton. The Cleveland Browns pondered, gave several interviews to candidates both inside and outside the organization, thought even more and then decided that their man might not have been the interim head coach, but was on the staff currently as the Browns hired offensive coordinator Freddie Kitchens to take over for the 2019 season. 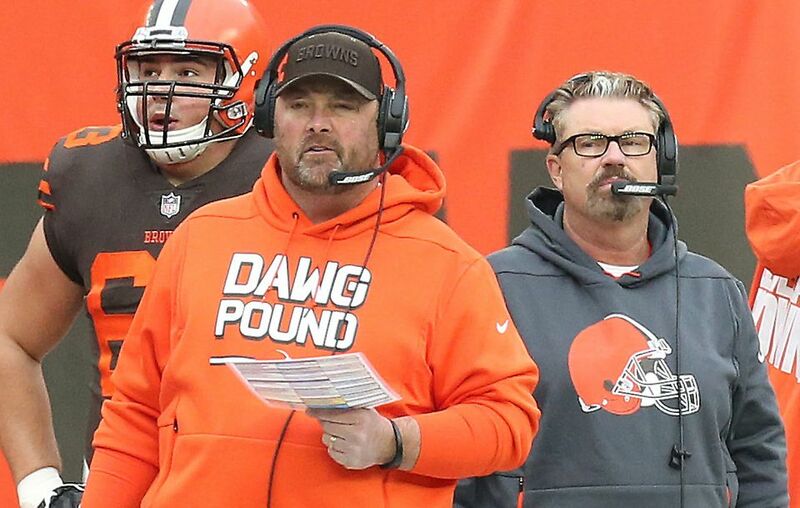 The 44-year-old Kitchens coached the second half of the season as the offensive coordinator and seems to have impressed enough people in Berea to retain the job in his audition, even over the actual head coach of those games in Gregg Williams. Kitchens spent the previous eleven years with Bruce Arians with the Arizona Cardinals as at various times he coached tight ends, running backs and quarterbacks with his time with veteran Carson Palmer coinciding with the three year run of the Cardinals as a title contender (as I wrote yesterday about in our post on Kliff Kingsbury and the Cardinals). Kitchens will become only the second current head coach in the league to be promoted to their job without a full season as a coordinator (Kansas City's Andy Reid was hired in his first job in Philadelphia from being Brett Favre's quarterback coach in Green Bay). It appears the main major selling points for Kitchens were the emergence of Baker Mayfield, who threw 19 of his 27 touchdown passes with Kitchens calling the plays after appearing to begin to fall into a funk under Hue Jackson after his initial success and therefore his relationship with Mayfield, who seems to have made a connection with Kitchens, both on the field and off- most recently when Kitchens defended Mayfield over a sideline "celebration" which cost him a fine and Mayfield's actions towards Jackson in the final home game. The former Alabama quarterback showed promise as a play caller and the Browns will hopefully retain him in calling the plays, although a veteran coordinator is almost an imperative on both sides of the ball, especially with the defense. The Browns will be looking for an almost entirely new defensive staff after Gregg Williams and many assistants including thankfully special teams coach Amos Jones were released yesterday. It appears that only two of the 2018 Browns defensive assistants will be with the team next season as defensive backs coach Dwayne Walker was mentioned as being retained and defensive line coach Clyde Simmons was not mentioned as staying but was not on the list of the coaches that were relieved of their duties either. 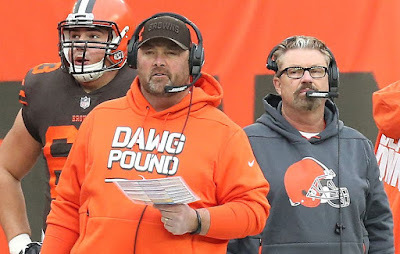 Gregg Williams was a pleasant surprise as a head coach and I wouldn't have been upset to see him given the full-time position, but much like Freddie Kitchens and frankly many candidates in this year's coaching silly season, I'm not jumping for joy or throwing items around the room either. This was not a great year to hire a proven coach as the only one available ( Bruce Arians counts, but the Browns clearly weren't interested) was Mike McCarthy and I was definitely not excited about hiring McCarthy. I can also understand and agree with the decision to allow Williams to pursue other opportunities. Williams defense was second in forced turnovers last season, but finished 24 against the run and 29th against the pass and combined with the only natural issues that would come up with Williams suddenly being the subordinate to Kitchens, it was best for everyone that the parting of the ways took place. On the overall, I'm fine with the hiring of Freddie Kitchens. Is it risky? Sure, but as noted only Mike McCarthy and maybe Adam Gase were candidates with an experienced background that would be considered more than a retread, so it's not like they passed up a terrific proven winner. The Browns are like several other teams that are trying something different and not all of these coaches are going to hit it big. Some will succeed, others won't and that's part of the business. 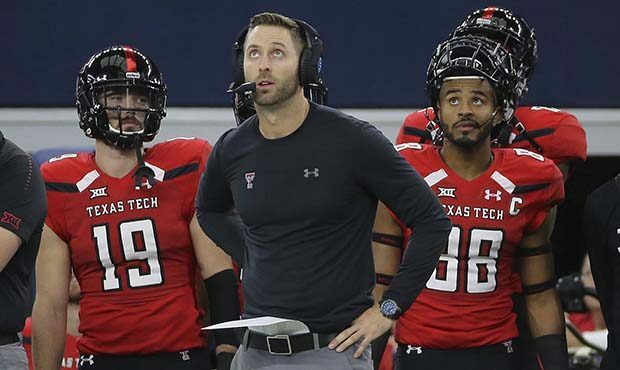 A little over a month after being fired at Texas Tech, Kliff Kingsbury has arrived in the NFL via a brief detour with the USC Trojans as the Arizona Cardinals hired Kingsbury as their new head coach. Looking at a 35-40 record over a six-run with the Red Raiders, one couldn't be blamed for wondering just what was the interest in Kingsbury all about and why on earth an NFL team is hiring someone that couldn't win in Lubbock. The answer is this- Kliff Kingsbury has enough positives to override a few concerns. First off, While I understood why Texas Tech felt it had to relieve Kingsbury of his duties, this could backfire on the Red Raiders. Texas Tech has always been a tough place to win consistently due to in-state competition for recruiting, the tradition at other schools and the isolated location in West Texas, so even though Kingsbury didn't win, Tech is on the verge (in my opinion) of making a move because Kingsbury's last team began to show signs of developing a defense, which in the Big 12 goes quite a distance and Tech's late-season fade was mainly due to an injury to freshman quarterback Alan Bowman, who was injured against Oklahoma in a game that saw Tech slug it out on even terms in a 51-46 loss. Tech might be sitting on a big year in 2019 and had an alum such as Kingsbury stayed, he may have become entrenched at the school for years. Kingsbury's offenses always scored tons of points with talent that wasn't nearly as strong as the better teams in his conference and his work with Patrick Mahomes was outstanding. I loved Mahomes coming out of Texas Tech and I had him ranked as my top ranked QB when many shrugged him off as another Big 12 system QB ( BTW- If I'm going to get hammered for not liking Baker Mayfield coming out, I want the credit for being dead-on about Mahomes. Fair is fair). Much of that was due to the work and refinement that Mahomes received from Kingsbury, who also worked with Baker Mayfield (before his transfer), Davis Webb (Giants draftee) and as offensive coordinator, Kingsbury helped Johnny Manziel (Texas A&M) and Case Keenum (Houston) to excellent college careers and in the case of Keenum. a decent NFL career. Kingsbury will work with Josh Rosen, who struggled in his Cardinal debut after being selected by them in the first round last year and hope that he is able to hit it off with the former UCLA Bruin as this only works if Kingsbury develops Rosen or is able to last long enough to be involved with a replacement a few years down the road and that won't be easy as the Cardinals are far from bowling one over with offensive talent. David Johnson had a mildly disappointing 2018 season after returning from an injury that cost Johnson all but one game in 2017 and Josh Rosen's top receiving target was 35 years old Larry Fitzgerald. Head coaching hires in the NFL is similar to imagining slot cars moving around a track. For a lap or two, offensive backgrounds are preferred and then it can become defensive, only to emerge with teams wanting experienced hands with head coaching or high-level assistant resume's and the current lap shows team wanting younger coaches with what is currently considered to be "innovative" playcalling or systems. Kliff Kingsbury fits that mold right now and on his resume', I wouldn't think that he would be a particularly attractive candidate for a power five college job, let alone the NFL, but the time is right for his skills to receive a chance, that chance might have not been available five years from now and it wasn't five years ago either. One other factor to consider to those wondering just how on Earth, all of this occurred in a month. Remember with the exception of one miracle run for a 9-7 team with a Hall of Fame passer (Kurt Warner) that saw them reach their only Super Bowl, a strong three year run under Bruce Arians and three more years under Don Coryell (in 1974-76! ), this is a franchise that has generally been rotten under the Bidwill family for the last 50 plus years! One could make a real argument that the Cardinals over the last 50 years have been the NFC version of the "New" Browns along with the Detroit Lions for sustained mediocrity. The Bidwill's have hired coaches with track records (Gene Stallings,Buddy Ryan and Dennis Green), In-house "players" coaches (Dave McGinnis), veteran defensive coaches (Vince Tobin), young coaches (Steve Wilks), offensive flavors of the time (Ken Whisenhunt), offensive line coaches (Joe Bugel and Jim Hanifan), college coaches (Don Coryell) and even legends from the past (Bud Wilkinson) and with the exception of the short term blips on the radar, the Cardinals haven't been able to be successful. Will Kliff Kingsbury take his place in the Cardinals graveyard of failed head coaching experiments? Or have the Cardinals finally found their long term answer through taking a chance on the next big thing in football innovation? It'll be interesting to see. Back later with the Browns hiring of Freddie Kitchens as their new head coach. The Cleveland Indians have been criticized for their inaction as far as improving their roster in preparation for the 2019 season and that criticism doesn't likely go away after a minor deal with the New York Mets. The Indians added catcher Kevin Plawecki from the Mets in return for minor league infielder Sam Haggerty and pitcher Walker Lockett as Cleveland looks to build up a catching corps weakened by the trade of Yan Gomes to Washington. 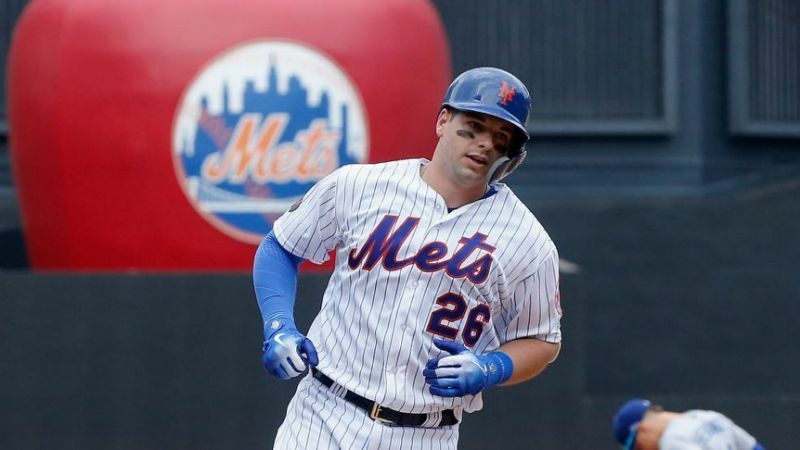 A one time upper-level prospect, Plawecki has struggled to hit in the big leagues, although he has shown flashes of decent power in his major league appearances with 14 homers in 700 at-bats over four seasons. Plawecki has struggled to make decent contact in his Big Apple chances as he hit .210 last season and carries a career average of a mere .218. Plawecki is a decent defensive catcher and threw out 16 of 70 attempted theft attempts last season. Plawecki could be either the backup to Roberto Perez or should Eric Haase force the issue, the soon to be 28 years old, Plawecki could be the starter and standby mitt in AAA Columbus. In either event, it doesn't figure impact the Tribe very much, but occasionally a player that was touted and somewhat disappointed does go for the proverbial fresh start and turn things around, so one can hope for that. The Indians had recently acquired Walker Lockett from the Padres in November, so Lockett never even was a "Hi Corbett" Indian. Lockett was ripped in four late-season starts in San Diego with a record of 0-3 with an ERA of over nine, so he was likely an arm that was acquired as a hired gun for AA Akron or AAA Columbus after a 5-8 season with a 4.79 ERA for the Padres AAA affiliate in the West Texas town of El Paso. Sam Haggerty hit .243 with four homers in 87 games for AA Akron and stole 24 bases. I wouldn't label Haggerty a prospect, but with the ability to play second, third and short, Haggerty is the type of player that can hang around AA and AAA for a long time.